A lot of Motorola devices are receiving the official Android 8.0 Oreo firmware update. This time the OTA is rolling out to the stunning Moto Z Play with latest Oreo build. The OTA update is currently being rolled out in phased manner within countries like the USA. So if you have a Moto Z Play, go to settings > about phone > system updates > and check for an OTA update notification. If not, then install the OTA zip available in the download section below using the following instructions via stock recovery or ADB sideload method. 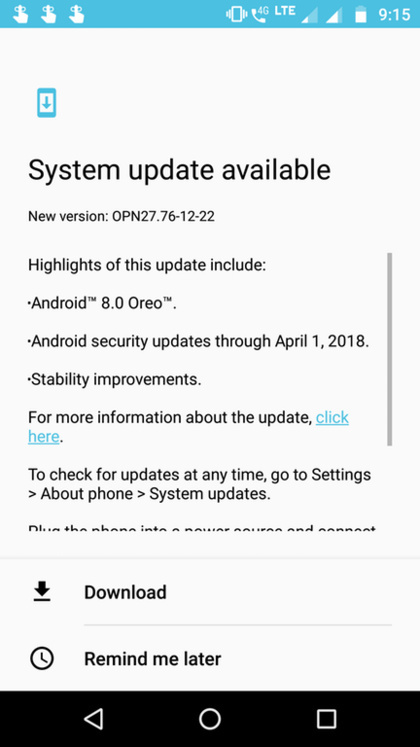 More on the OTA update, it features the latest April 2018 Android Security Patch. The Motorola Z Play now gets a new firmware build number OPN27.76-12-22. As the update is based on Android 8.0, it features all the Oreo goodies such as notification channels, advanced app permissions, aggressive doze mode, Picture-in-Picture, and much more. The OTA zip file weighs about 115 MB, but the captured OTA below weighs 1.12 GB in size. So it can be used as a stock firmware zip as well. Motorola is now stepping into the update game. We have already seen the flagship Moto X4 receiving Android 8.1 Oreo update. Moreover, the Moto Z, Moto Z and Z2 Force are already on the latest update. Eventually, the Moto G5 (Plus) and G4 (Plus) will be updated to Oreo as well. The latest Android 8.0 Oreo OTA update zip has been captured by one of the Moto Z Play users. The update is for the retail US variant. However, it can also be installed on other variants. The OTA listed below can be flashed from the previous Nougat firmware to the latest Oreo one. We already have the November security patch OTA available. As it is a stock recovery or ADB sideload method, it will first verify the device and then flash the update zip. So there is no harm in trying. You can also manually capture the OTA update for your Motorola device from here. The installation method is simple. You can simply reboot into stock recovery mode, choose to install using SD Card or internal storage. Alternatively, you can choose the option install using ADB. Follow the tutorial link below to know how to install OTA updates on any Android phone. How to root Oreo update? Follow us for the latest Android updates, news, and downloads. the link results in an error – can’t download the OTA file – help? Hi, The links have been updated.